The US president posted a tweet about the meetings with Lavrov and Klimkin. 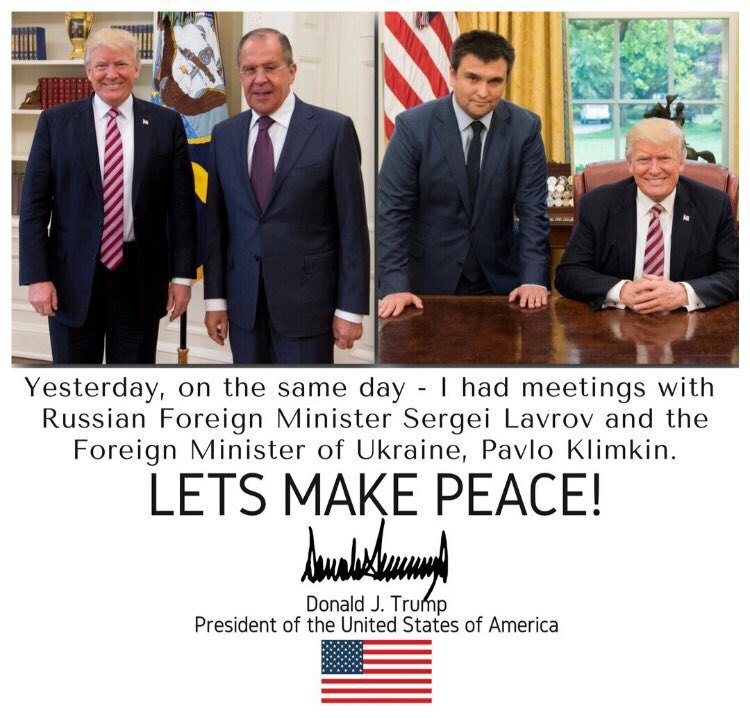 President of the United States Donald Trump posted on Twitter photos from meetings with Ukrainian Foreign Minister Pavlo Klimkin and Russian Foreign Minister Sergey Lavrov, accompanied with a call for peace. "Yesterday, on the same day - I had meetings with Russian Foreign Minister Sergey Lavrov and the FM of Ukraine, Pavlo Klimkin. #LetsMakePeace!" Trump twitted. Trump's meeting with Lavrov at the White House took place on May 10, was focussed on Syria and Ukraine. Trump noted during the meeting that the responsibility for ensuring the full implementation of the Minsk Agreements lies with Russia. A few hours later Trump held a meeting with Ukrainian Foreign Minister Pavlo Klimkin. The minister said that he asked the US to join the "Normandy format" of talks on Donbas.